Help us beat last year’s donation of 1,800 turkeys to the Christmas Cheer Board. For every vehicle leased or sold, we will donate one Granny’s Poultry turkey on your behalf to a family in need. This Christmas, let’s help even more Winnipeg families! 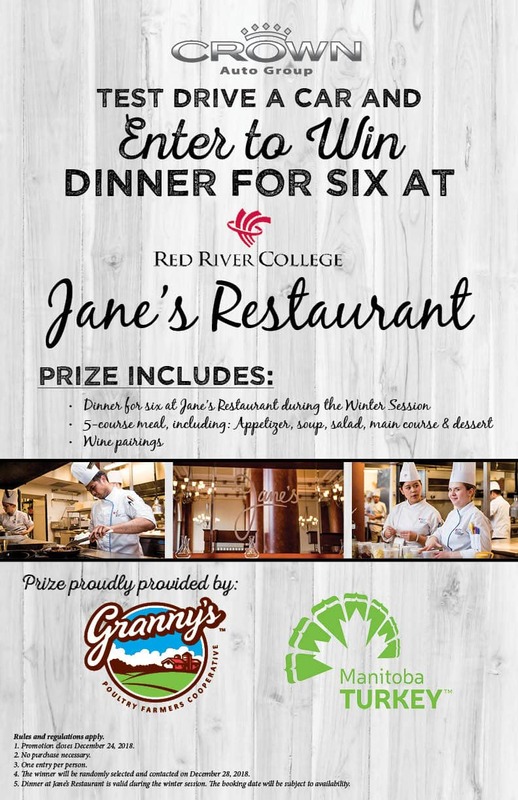 From now until December 24th, come in for a test drive and enter to win a dinner for SIX at Red River College’s Jane’s Restaurant! Prize proudly provided in collaboration with Granny’s Poultry and Manitoba Turkey Producers. Promotion closes December 24, 2018. The winner will be randomly selected and contacted on December 28, 2018. Dinner at Jane’s Restaurant is valid during the winter season. The booking date will be subject to availability.